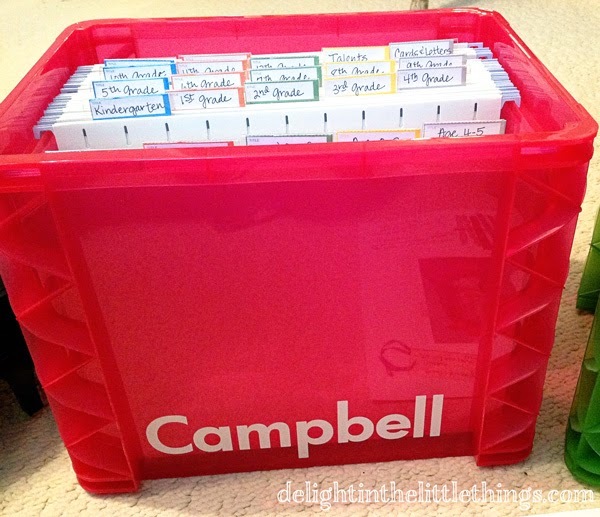 I have seen several pins lately that have inspired me to get my act together and organize my girls' school papers. The paper tiger at my house is ferocious and I will admit that I am pretty awful at getting it under control! I found some great ideas on other blogs on how to pull this together. This example from Kylee of Destination Domestication served as my inspiration for the outside and file tabs of my boxes. Kylee has a great description of what she did and how she did it. It encouraged me to start NOW even though my oldest daughter just turned 10 years old. 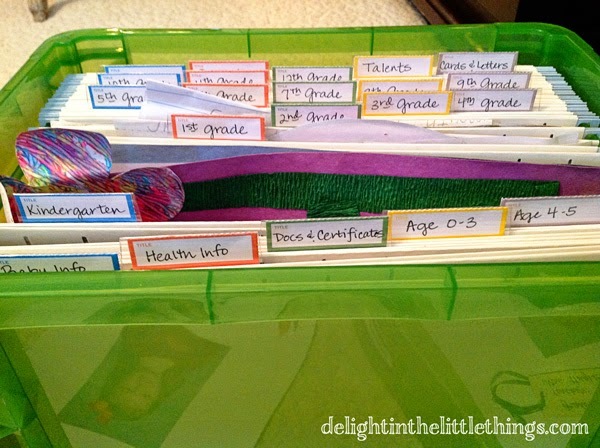 I also love the way Jen from I Heart Organizing put together her file boxes for her children. Her idea to create a page for each child with information and pictures was great! Kiki from Kiki and Company guest blogged on Tatertots & Jello with a Back to School Interview Printable. It's super cute and a free download. To put mine together, I picked up some inexpensive plastic file boxes from Target for about $10 each. I used my Silhouette Cameo to cut out each of my daughters' names in white vinyl and transferred them to the front of the file boxes. This was a very easy project if you are new to the Silhouette Cameo. I loved how they turned out! I used hanging file folders that I ordered from Poppin for the boxes. If you aren't familiar with Poppin, they sell desk, office and school supplies and organize them by color on their site. Lovely stuff! My file categories were mostly the kids' school years, but I also created files for Baby Information, Health Information, Docs and Certificates, Cards and Letters, and Talents/Hobbies. What's nice about this system is that it is flexible. You can change it as your child ages and add files if they really get into a specific sport or activity. For each school year, I made a page to capture special information about the year. 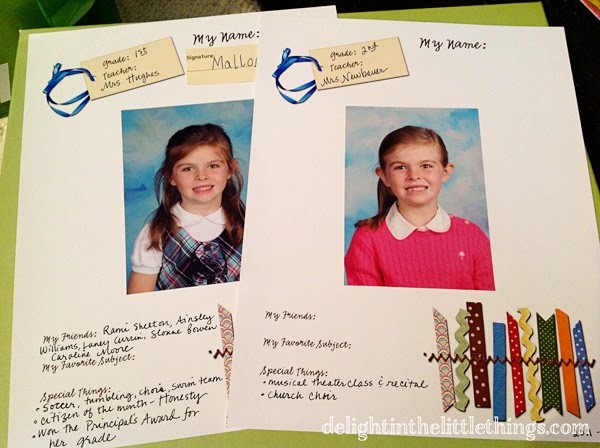 I created a header using some digital scrapbook elements I've had forever and then left a large place for my girls' school pictures for that year. Then I had room for a few journaling prompts about their teachers, friends and activities. Now we have a great place to store report cards, writing samples, stories, certificates, programs from school plays and church activities and lots more. I love it because it gives me a specific place to put some of those papers that usually end up in stacks around the house hoping I'll get back to them some day. Want to make this project? Help yourself to our free printable! 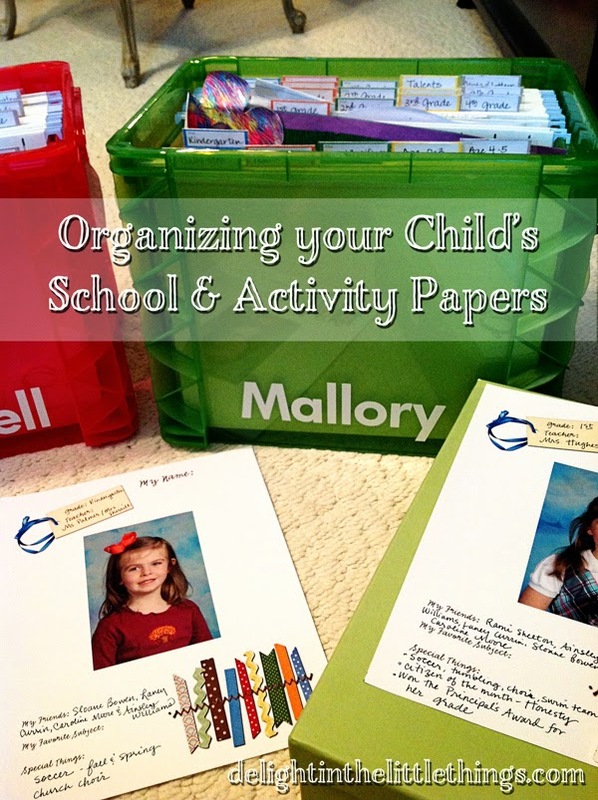 How do you organize your child's paperwork? We have lots of back to school inspiration on our Pinterest board. Follow us for delightful ideas! Follow Sassafras Paper's board back to school on Pinterest.